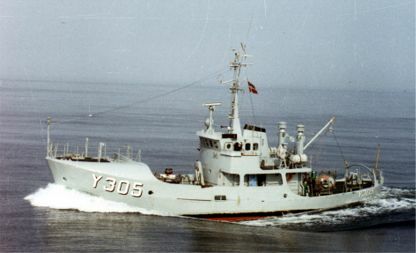 Friday 22 July 1994 naval cutter VEJRØ left for a routine patrol for Naval District Sundet. It was to be a most unusual patrol. On 23 July the naval cutter was rammed by a container ship while at anchor in Fehmern Belt. The material damage on the cutter was extensive but the crew got off lightly. Naval cutter VEJRØ was fouled by a container ship in Fehmern Belt. The crew was in high spirits after 3 weeks holidays with excellent weather and a weather forecast boding well for the following weeks. The destination was "the stick", the crews’ pet name for the Fehmern Belt buoy where the cutter anchored up. Around midnight the ship settled down. The anchor watch monitored the waters and in the clear weather with a visibility of almost 20 km lots of reports went into the naval district. When the anchor watch turned at 3 am only two ships were in sight. The most interesting came from the east and was positioned a couple of nautical miles from the buoy. The vessel was plotted on the radar so later on the watch could read its course and speed. When the vessel passed the buoy it set course directly towards VEJRØ so that the masthead light and both sidelights were visible. This is normal, however the ships usually continue their turn so to explicitly clear either to starboard or port. This ship continued on its course. The watch became uneasy and used the foghorn several times which immediately called the captain to the bridge. The watch was illuminating the other ship with VEJRØ's searchlight but the ship did not alter course. The captain also sounded the horn but without results after which he sounded the ship’s internal alarm to get the crew on deck. The other ship was continually illuminated by the watch with the searchlight giving short flashes at the same time as VEJRØ sounded short blasts from the foghorn and finally one continuous tone. When the vessel was within 200 meters distance the captain estimated that it would not turn but collide with VEJRØ. The watch and the captain hastily cleared the bridge to go to the quarterdeck where the ships’ crew were with their survival suits and life vests. The distance to the other ship was less than 50 m and it became clear to everyone that VEJRØ would be fouled. VEJRØ seen in the dry dock in Svendborg with portside crushed. Seconds later the collision happened portside amidships. 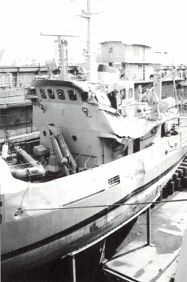 Those who had not jumped into the water were forcibly thrown over board and were in trouble under VEJRØ which after the collision careened more than 100 degrees (part of the superstructure were under water). The captain, the ships’ cook and one of the engine room staff were caught in the lifelines on the quarterdeck. Entangled in these lines the captain and the cook practically had their shorts sucked off when the other ship passed overhead. After the passage of the ship the cutter straightened up again and the crew were freed and could swim to the surface. It was a matter of seconds but it felt like minutes. had been pulled up when VEJRØ straightened up, lowered the pilot ladder so that the rest of the crew could climb on board. After confirming that all was on board and no one seriously injured the captain went to the bridge and sent out a MAYDAY on channel 16. At the same time the chief started the engine and the crew, now all in survival suits and life vests, started to pump the ship free of water. 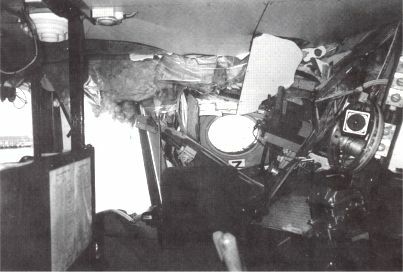 The inside of the bridge of VEJRØ suffered severely at the collision. The other ship, a container ship from UNIFEEDER, made itself known and apologized for the collision and offered assistance but it was not necessary as a German search- and rescue vessel had arrived. A deckhand was transported to a German port where he had a deep gash in the foot and a split eyebrow sutured. He came back to the cutter after a few hours. After assessing the damages it was decided to set course to Korsoer where several of the crew went to the emergency room for a check-up by a doctor. Monday the crew reported for landing of weapons and ammunition and Tuesday an inquiry was held in Korsoer. The Commander of 2nd Squadron was assessor for the captain of VEJRØ. Present were also the Naval Judge Advocate, the Deputy Chairman of the Naval Accident Investigation Board and a representative of the Junior Counsel to the Treasury. Tuesday afternoon VEJRØ was towed to Svendborg repair yard by the naval cutter SAMSØ. Because of the collision the crew of VEJRØ, who takes over the sister ship FARØ, now had a tight knit friendship and have processed the experience with good help from the Defence Center for Leadership. The article is reproduced here by permission from Søværnets operative Kommando (Admiral Danish Fleet).